Oh spring is in the air! 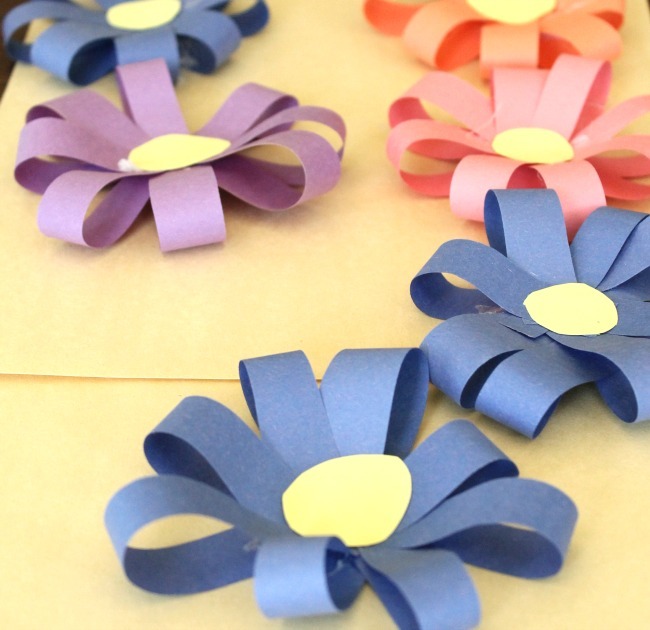 And with this simple spring craft, spring will be on the walls, doors, and kids too! 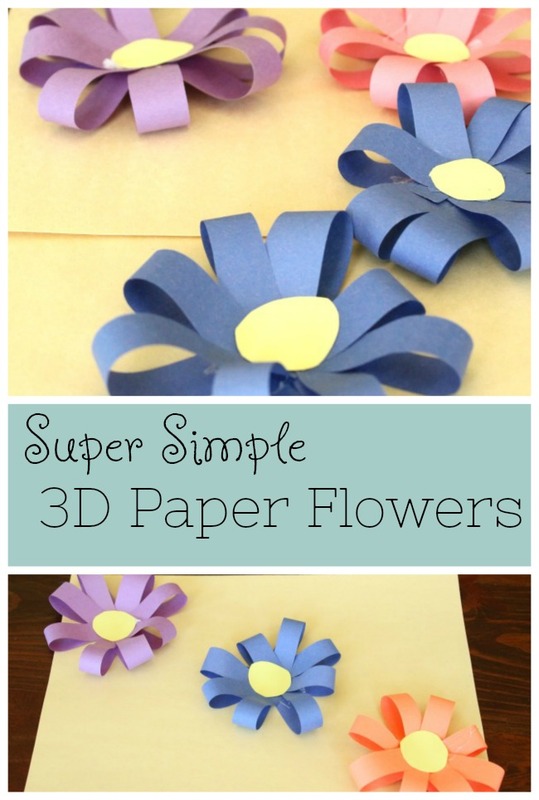 These simple 3D paper flowers were a blast to make today. The boys wanted to do some crafting and I have a serious case of spring fever so opted for a spring craft. Nothing says spring quite like flowers. Well, I suppose some beautiful spring weather would help … but it will come. It has to! 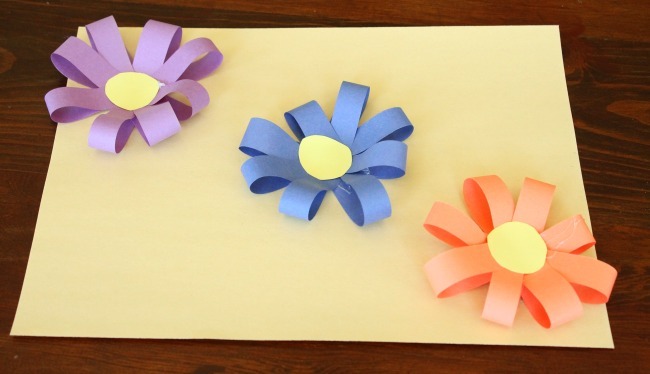 To make these 3D paper flowers I cut some thin strips of construction paper. I was hoping a glue stick would do the job, but I plugged in the hot glue gun just in case. (BUT our glue sticks worked excellently). 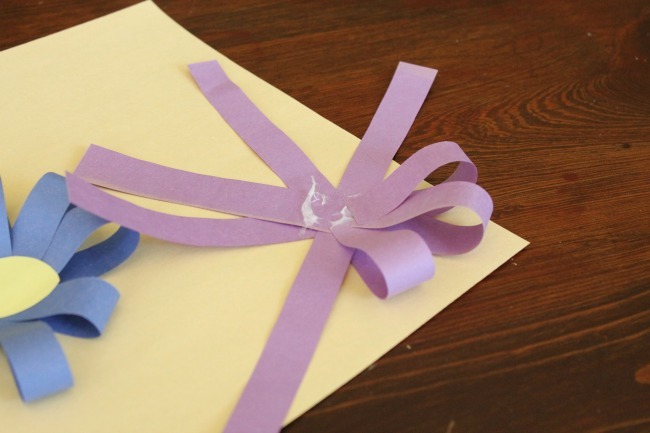 First, we laid down one strip of construction paper and added a dot of glue stick glue in the middle. Then, we laid a second strip across that one horizontally and added another dot of glue in the middle. We continued this for four strips of construction paper. 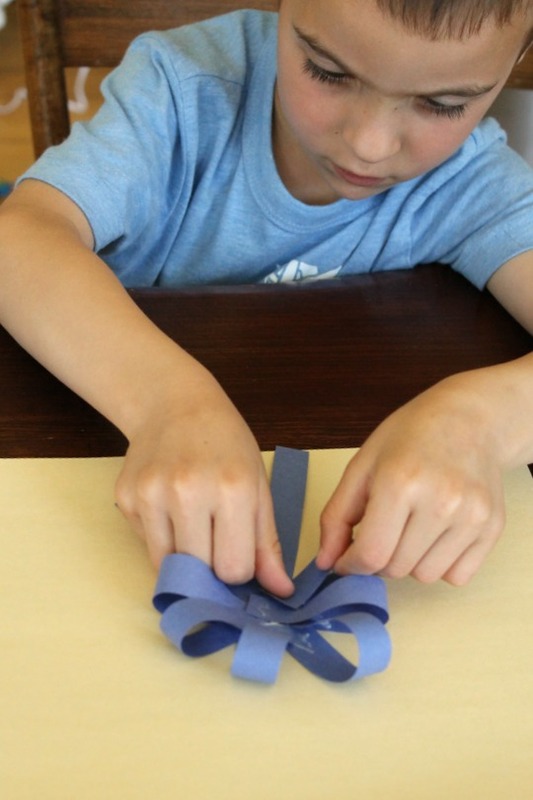 After, we bent one end of construction paper at a time into the middle and secured with glue. Once all of the petals were formed we glued a yellow centre onto the flower. Sam, who is 8, was eager to use the hot glue gun, so he opted for that glue which of course worked well also. 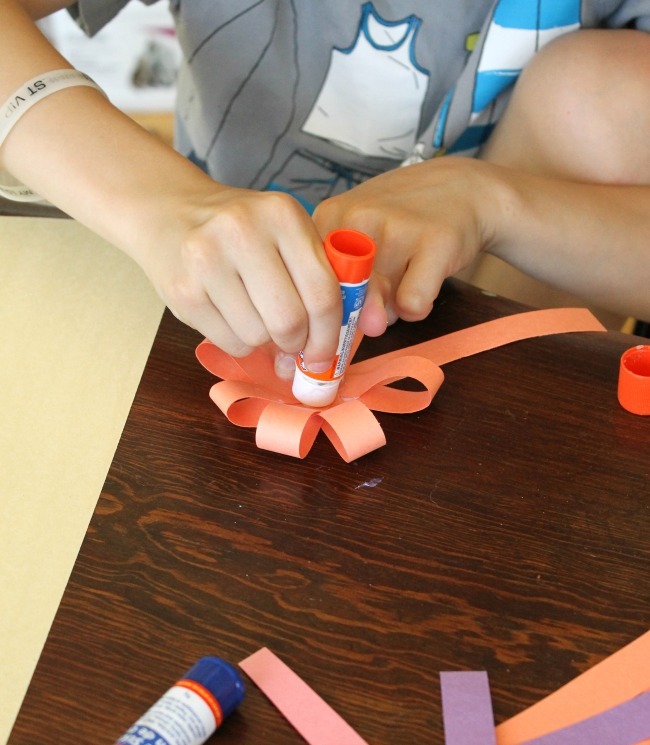 It also made this craft very engaging and fun for him. I originally thought we would glue these down to construction paper but my little guys loved them being free. With some painter’s tape they attached them to bedroom doors, windows, even themselves. 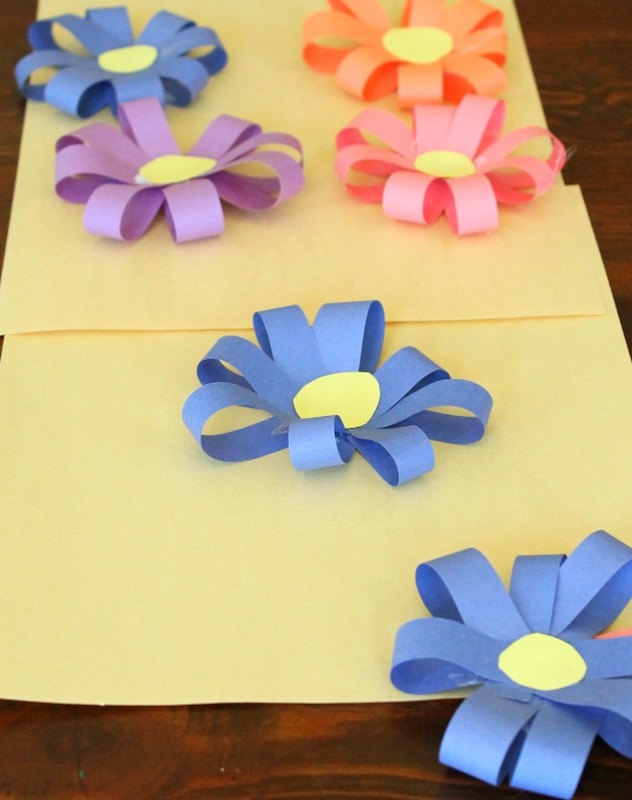 A very spring craft to add some pretty flowers, and counting as well, to your day! I hope you are having a wonderful spring friends. Thank you so much for reading. Oh wonderful! What a great idea – thank you for sharing!